Join us August 31, 2019 for a daytime tour and an evening farm-to-table dinner benefit. Tour the beautiful countryside of the North Fork Valley this Labor Day weekend! Located at the base of Mt Lamborn on the Western Slope, the North Fork Valley is abundant with organic farms, orchards, wineries, and artists’ studios. The tour day starts at 10am and concludes at 4pm. Farm tours and demonstrations are scheduled in two-hour time blocks throughout the day, and artists’ studios are open 10am to 4pm. Enjoy a Happy Hour at Remedy Juice Bar Cafe at 5pm. And, be sure to make reservations for our Celebrate the Fork farm-to-table dinner at Edesia Kitchen at 6:30pm. 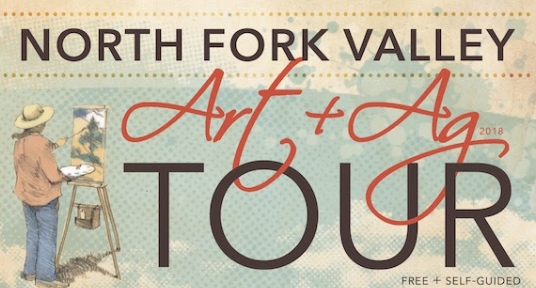 Proceeds benefit the North Fork Valley Creative Coalition. Tour is free, happy hour is on your own, and our Celebrate the Fork dinner benefit is $75/person. Make the North Fork Valley your Labor Day destination! WE ARE A THRIVING COMMUNITY WHERE ART AND AG MEET!